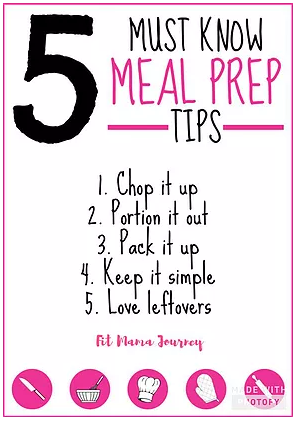 Meal Planning and Prep can be a very overwhelming task but it doesn't have to be. If at first you make things simple than you can build upon and get more creative and experience more. There are 7 days in the week, Only plan meals for 3 days. You will repeat your meals and have 1 day as a "Clean Up" Day. For example: Meal plan for Sunday, Monday, Tuesday. On Wednesday you will repeat the schedule from Sun/Mon/Tues then Saturday will be a clean up day. This is the day you eat the leftovers of produce and put together a makeshift eating plan so that you do not waste any food. Grab a calendar so you can easily write down your meal plan and have a visual. Go through each day and list 3 fruits and 3 veggies each day. Either as a snack or with a main meal. Now plan out what 3 main dinners you will have. I like to ensure I have lighter dinners without grains or carbs. Although I have a house of 6 and many times they still want breads/pastas and etc so I just plan better. For instance, if we are having a spaghetti night. I will cook them regular noodles and make me Zucchini noodles. Although, I still serve them a side of Zucchini noodles as their veggie. Or tacos, they can have the grain shells and I will make Taco boats out of Lettuce. Write Down your 3 dinners on your calendar. Now all that you should have left to fill in will be breakfast. Make sure you are realistic with the time you have to make breakfast. I tend to always go for easy meals like Peaches N Creme, Homemade Yogurt Parfaits but if you plan ahead of time you can make breakfast ahead of the time and store it like Egg Muffins or Burritos. Look back at each day and make sure you have a balanced portion of when you will be eating your food. Meaning, Don't have the majority of your snacks before lunch or after, Even it out so that you can keep fueling your body to burn more calories. Now that you have the food back at home. never throw it in the fridge whole.